There's no time more important in daily life than meals with the family. 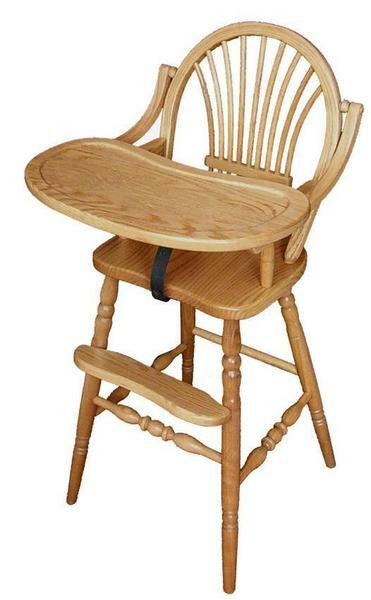 This Classic Sheaf solid wood high chair - crafted by hand in a small Amish woodshop to a traditional design and enhanced with contemporary safety features - is designed to provide a secure and comfortable spot for the family's smallest member while adding something a little bit special to the look and feel of the kitchen or dining room. Built from solid wood and finished to a perfectly smooth sheen by hand, this high chair brings with it the promise of years and years of happy, repair-free use. The front tray's rounded edge keeps things elegant and simple, and its convenient lip offers extra protection against creative spills and other toddler-led dinner experiments. Added safety straps and a strong, solid build offer premium security, promising generations of comfortable dinnertimes for the whole family. This high chair is available in your choice of wood and stain, enhancing its standout look even further. If you've any questions at all, we'd love to answer them by phone or by email - please don't hesitate to get in touch.